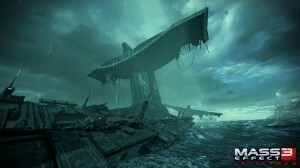 Bioware announced the first single-player DLC for Mass Effect 3 yesterday, called Leviathan. At 800 Microsoft points it adds a new adventure to Shepard’s pre-Earth assault story. I’m sure a lot of people will skip this since they already know how things end, but I’m looking forward to it. I’ll take any chance to spend more time in the Mass Effect universe, even better if it’s with Shepard and his team who I’ve gotten to know so well over the last five years. Found this in my Evernote drafts, pretend like I posted this a week ago as I’d intended to. Obviously I need to work harder on my resolution not to publish and not over-edit or leave stuff in drafts forever. I’ve been catching up on my news feeds today and just ran across the drama about Mass Effect 3’s day one DLC, From Ashes. After listening to Total Biscuit and reading various posts, I’m left wondering why there wasn’t the same huge deal made out of the Warden’s Keep DLC for Dragon Age. I don’t remember blogging about it, but I remember being pretty pissed off that somehow there was DLC available for a game on the same day it launches. I’m very curious to see how this DLC integrates into Mass Effect 3, but it can’t possibly be worse than Dragon Age: Origins where you actually had a quest prompt that then redirected you to the store. Regardless of the realities of scheduling, where developers actually have time between completing a game and when the game ship to implement new content for digital distribution, it just feels like the design of the game was scaled back and I’m not getting the complete package for my initial money paid. Logical or not, it would be better for developers to hold DLC until after the first week or two as suggested by John Walker on RPS. For myself, I had pre-ordered the Collector’s Edition from Amazon months ago (the day it was announce actually) so I’ll be getting this DLC gratis. I ordered the Collector’s Edition because I love the series. Were I waiting for launch day to pick up a regular copy, this DLC wouldn’t have changed my mind about just getting the basic edition. I understand that some people feel like this content will be integral to the story and so they’ll be missing out unless they pay the additional dollars. This may be true, but frankly I doubt it will be that central to things, and once I’m done with the game I don’t really think I’ll miss whether or not there was one additional character on my crew. Honestly, I’m a tiny bit glad it will be available at launch, I think I would’ve enjoyed having Kasumi along on more missions rather than just the Stolen Memories DLC. I’ve been looking forward to the upcoming Mass Effect 2 DLC, Lair of the Shadow Broker, ever since it was announced. Now that I’ve seen the video for it, I’m very very excited. It looks really good. I can’t wait for the 7th, although it would’ve been nice to have it for the holiday weekend. Of course the burning question now is: what will happen with my Sheppard’s romances? He was with Liara in the first game, but now he’s with Tali.